Reed Incorporated provides professional and reliable security, training, logistics, construction management environmental services and demining for clients worldwide. 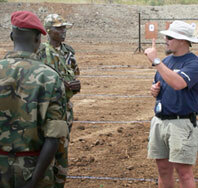 We specialize in operations located in remote, third world, multi-cultural and high-risk geographical environments. Our diverse teams, chosen from our worldwide network of highly skilled and experienced specialists, include many former military Special Forces and law enforcement personnel. Each team is a tailored to meet our clients’ needs and to suit the requirements of individual projects. Reed has provided mission critical support services globally for more than a decade. We have established ourselves as one of the leading operational solution providers for governments, corporations and NGO’s conducting operations in austere, hostile and challenging environments.